Two girls crying after the viewing service for Gina Montalto, one of the victims of the shooting, in the Kraeer Funeral Home in Coral Springs. Russian-linked influence networks on Twitter boosted hashtags on both sides of the U.S. gun control debate in the aftermath of the Parkland, Fla., school shooting on Feb. 14, and have been doing so ever since, analysis shows. Earlier this week, they also amplified a conspiracy theory that teenage survivor David Hogg was a “crisis actor” and part of an elaborate hoax. On the day of the attack, they started promoting #floridashooting and #guncontrolnow as hashtags, and linking to a story that originally linked accused gunman Nikolas Cruz to a neo-Nazi organization in Florida. By Feb. 16, they were also promoting #falseflag, a tag for arguing the shootings were faked, (at about the same frequency that they were promoting #gunreformnow, promoting gun control). On Feb. 18, as a gun-rights backlash against calls for gun control gained momentum, they started promoting #2adefenders, a gun rights tag. They were also still promoting stories like this one, which questioned the authenticity of victims’ accounts of the shooting. The data was gathered by Hamilton68, a project of the German Marshall Fund think-tank, which tracks about 600 troll and bot accounts it says are “linked to Russian influence operations.” Mostly, they tweet about Ukraine and Syria, but sometimes amplify the extreme right in the U.S. It provides a real-time look at what messages Russian-linked accounts are promoting on any given day, and what debates they are trying to influence. The pattern is several years old. The aim seems sometimes to amplify a particular side of a debate, sometimes to stoke fear and divisiveness more generally. Hamilton68 also documented activity on Russian accounts around the mass shooting in Sutherland Springs, Texas, last November, and RT, formerly Russia Today, ran a fabricated story claiming the gunman belonged to Antifa. In May of 2016, Russian propagandists used social media to orchestrate both a white-supremacist rally in Texas and also the protest against it, for a total cost of about US$200, CNN reported. And in 2015, racially charged protests at the University of Missouri descended into panic as fake reports spread that the Klan was attacking demonstrators and had severely beaten a child. The report, which was given credibility after the student body president retweeted it, was traced to a now-defunct Russian troll account, @FanFan1911. It was amplified by a combination of bots and real people who were taken in. Shortly afterward, the account started tweeting in German, spreading rumours about Syrian refugees in Europe, Prier wrote. And early in 2016, it switched back to English to tweet about the U.S. election. WATCH: A Florida school shooting survivor is one of many slamming certain websites and fringe social media channels for calling him “fake” after a video purported him to be a “crisis actor,” but said the theories are helping raise attention to the calls for better safety at schools and gun control. Wannabe Internet detectives named a Michigan man as the killer of a Virginia woman in Charlottesville, Va., in 2017. (He once owned the Dodge Challenger used in the attack, but sold it years before.) Now, he’s suing a number of people, including Gateway Pundit’s Jim Hoft. In a Medium post, Jonathan Albright points out that Google’s autocomplete search suggestions are easily gamed, with often-toxic results. 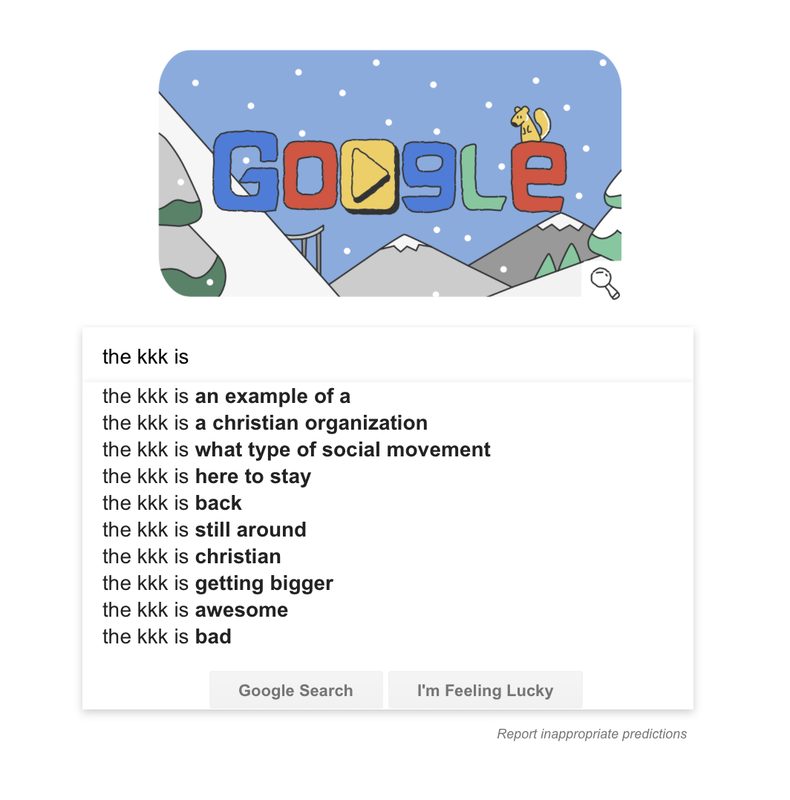 (Example: “the kkk is” suggests autocompletes of “a christian organization,” “here to stay,” “christian,” and “awesome.”) “Why does this matter? It matters because this is information pollution at the most critical interface: search. Google is the knowledge portal for most of the world,” he writes.